Intel Centrino laptops using Banias and Dothan processor cores revolutionised mobile computing performance with their combination of high processing power and low battery drain. As I discussed in PC Notes May 2006, the dual-core Yonah of Core Duo laptops provides even more processing power and the possibility of even longer battery life. It's hardly surprising, then, that these three Pentium-M processors have proved extremely popular with both mainstream computer users and musicians. Coming soon to a PC and Mac near you: Intel's latest Core 2 Duo processors should provide extra clout, yet should still be easy to keep cool — a perfect combination for the PC musician. Meanwhile, Intel's traditional Pentium 4 desktop processor series has gained the reputation of being more difficult to keep cool and, in some situations, providing worse performance than AMD's popular X2 dual-core desktop processor range. Consequently, many musicians have looked enviously at the Pentium-M processors of the Centrino range as a possibility for desktop computers. As I described in PC Notes August 2005, you can now buy several desktop motherboards supporting Pentium-M processors, as well as Pentium-M 'Desktop adaptors' that fit into some Intel Socket 478 motherboards originally intended for Pentium 4 models. The only problem with the Banias, Dothan and Yonah processor cores of the Pentium-M family is that they don't support 64-bit operating systems such as Windows XP Pro x64 or the forthcoming Vista. After all, the future is most definitely going to be a 64-bit one for PC and Mac users alike, so if you're buying a new PC and want it to last as long as possible, 64-bit compatibility is increasingly important. With this in mind, many people are getting excited by a new range of Intel processor cores, code-named Merom, Woodcrest and Conroe, which will be available shortly. They share the same basic architecture, similar to the Pentium-M series in principle but offering 64-bit support. Merom is intended for laptops and Woodcrest for servers and workstations, while Conroe supersedes Intel's current Pentium 4 range for desktop machines. Apparently, the Pentium 4 name will finally disappear for ever. 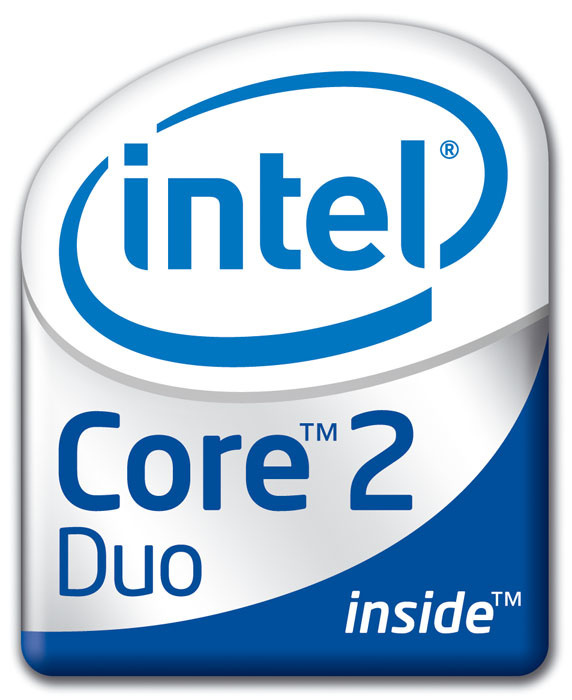 While the Woodcrest core has been given the official launch name of 'Dual Core Xeon', the Merom and Conroe will both be marketed as 'Core 2' processors, and the ones we'll be interested in as musicians are the dual-core 'Core 2 Duo' models with (as it says on the tin) dual cores. It won't be long before we can try them out, either, because, although the 'Core 2 Duo' name was only confirmed by Intel in May of this year, there's a promised shipping date of July 23rd. The processors should therefore have been out for a couple of weeks by the time you read this. They will initially be available in 1.86, 2.13 and 2.40GHz versions, all featuring 4MB of Level 2 cache that can be dynamically allocated to either core, and there will also be a new Core 2 Extreme version with extra graphics capabilities for game players. If you've recently bought or built a Pentium 4 Presler-based PC featuring an Intel 975X chip set, you may be able to unplug the Presler and pop in a Conroe instead, depending on the motherboard revision. If the motherboard shipped from April 2006, it may have the more sophisticated CPU power-supply circuitry required by the Conroe range already on the motherboard (you can check on the motherboard manufacturer's compatibility list). If, on the other hand, you're just about to buy, a motherboard featuring Intel's 965 chipset is a safer bet, since these will all support the Conroe range. You'll also shortly see a new Apple Mac desktop computer featuring a Conroe processor, that will replace the current Power Mac G5. We all know about the excellent performance of Core Duo laptops, but the reason for all the excitement is that the Conroe desktop Core 2 Duo processor apparently abandons some of the clever power-saving laptop features in favour of even better processing performance, but is still far easier to keep cool than the Pentium 4 range. Merom has a very low 35W Thermal Design Power, and while most Conroe and Woodcrest models have one of 65W, this has to be compared with the 95W of the latest Presler 2.8 and 3.0GHz Pentium D models and the 130W of the 3.2 and 3.4GHz versions. While Intel claim that the Merom will deliver 20 percent more performance for the same power level as the Core Duo, for desktop users the Conroe will offer an even more tantalising 40 percent faster performance, using 40 percent less power than the current fastest Pentium D950 3.4GHz Presler processor. As always, it's difficult to predict exactly what audio performance we can expect, although initial tests by various web sites on pre-release samples all agree that Conroe performance is excellent across all types of application, exceeding that of other systems featuring more expensive Intel Presler Extreme Edition 965 3.73GHz and AMD FX60 and FX62 models. If you've got additional keys on your PC keyboard devoted to special functions such as Email and Favourites, why not change them, using Microsoft's TweakUI utility, to launch your choice of application? 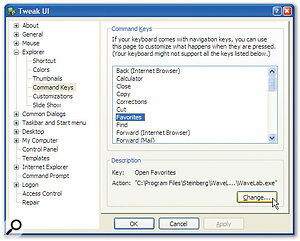 Here my Favourites key has been reconfigured to launch my favourite audio editor, Wavelab. While many PC laptops feature user-definable 'soft' keys that can be programmed, using proprietary utilities and drivers, to launch your choice of applications, many desktop PCs feature a clutch of dedicated keys to launch such things as Media Player, email applications and your Internet browser. What you may not know is that there's also an easy way to re-programme these to launch your own choice of applications, such as your favourite audio editor or sequencer, with a single key-press. Just download and install Microsoft's famous TweakUI utility (www.microsoft.com/windowsxp/downloads/powertoys/xppowertoys.mspx), and then have a peep in its Explorer section, where you'll see an entry labelled 'Command Keys'. When you click on this entry, a list of keys will appear in the right-hand window, and if you click on each of the special keys on your particular keyboard it will automatically highlight the appropriate entry in the list. Once an entry is highlighted, click on the Change button and you can choose to perform the default option, do nothing, or launch a custom program when the key is pressed. Loads of musicians have been attracted to AMD's X2 dual-core processor range over the last year or so because of its strong audio performance, but have been confused by the various chip set incompatibility issues (see PC Musician March 2006), while others have opted for PCs featuring the highly compatible Intel Pentium 4 D800 Smithfield-series dual-core range or, more recently, the D900 Presler series that runs slightly faster and cooler. With the advent of the Conroe series, it now seems that you can once again 'go Intel' and potentially achieve better performance than the AMD competition without needing more powerful cooling fans. As I write this, a few DAW builders have started to acquire engineering samples of the Conroe to test them out and perform some benchmarks, and the results may be out by the time you read this. Unless there are any unforeseen issues that hamper audio performance (a continual worry nowadays, it seems), I suspect that Conroe will become an extremely strong contender for music PCs. Many mainstream PC industry experts are already confident that Conroe will simply become the fastest desktop processor available to date (although, as always, AMD will no doubt respond in kind). This enthusiasm for the new Conroe range is also likely to have three consequences. First, the popularity of Conroe processors is likely to result in them being in short supply for several months after their release, and, second, Conroe prices are unlikely to drop until supply has outstripped demand. On a more cheerful note, other processor prices are likely to fall, so anyone about to buy a system based on an AMD X2 processor might want to hang on a month or two, to see if there are any bargains to be had. 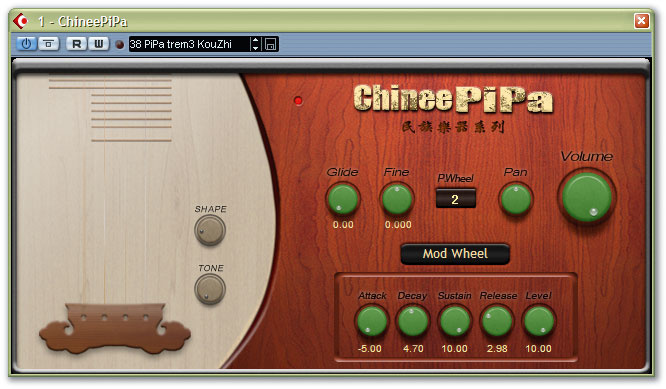 With an elegant interface, authentic sounds and a low price, Kong Audio's Chinee Pipa (Chinese lute) should prove a popular VST Instrument. The latest VST instrument in the excellent PC-only series of Chinese instruments from Beijing-based Kong Audio has just been released (watch out for a review of the rest of the range shortly in SOS). Chinee Pipa is a Chinese lute instrument based around a 245MB sample library that includes legato, tremolo and staccato performances, trills, rolls, slaps and various performance flourishes including harmonics, runs and hammer-ons. It features the same expressive engine as the rest of the series, which includes up to three sample layers selected in real time by velocity or mod-wheel position. With extensive control over the envelopes in all three layers, plus built-in filters and reverb, I found the 66 presets of the Chinee Pipa capable of highly authentic-sounding results with just a few minutes practice. At just $60, this download-only instrument is an absolute bargain, yet it's even cheaper if you buy two of Kong Audio's instruments or the whole bundle. Chinee Pipa is highly recommended for anyone who wants to add some oriental flavour to their music, and if you're not sure how to play it properly an excellent MP3 demo is downloadable from the web site. As these Intel developments continue, AMD have meanwhile introduced a new Socket AM2 format for their processor ranges. The new format supports DDR2 (Double Data Rate) RAM, with 30 percent greater bandwidth, and supersedes the existing Socket 939 and Socket 754 formats. You can already buy Sempron, Athlon 64, Athlon 64 X2 and Athlon 64 FX processors that are compatible with AM2. Unfortunately, while benchmarks do indicate improvements of a few percent with some applications, audio performance seems essentially identical to that of the older AMD Socket 939 format processors. On the positive side, AM2 processors do offer a 20 percent lower Thermal Design Power, for even easier and quieter cooling than their predecessors. Once again, the introduction of a new format will have the effect of pushing down prices of the older S939-format product range, resulting in more AMD bargains, so perhaps an S939 AMD X2—based PC will become an absolute bargain over the next few months. However, once Conroe appears it's likely that AMD AM2 prices will fall as well. Ultimately, all this competition is good for the end-user, but it does make decisions more difficult. I was about to build a Socket 939 AMD X2-based PC, but now I'm not so sure — perhaps I'll wait and stick with Intel after all, or see what happens with AM2! I would certainly recommend that anyone about to invest in an Intel-based system waits to see what Conroe audio performance is like, since musicians are going to benefit more than most users from its greatly reduced cooling requirements. Alternatively, if you're about to invest in an AMD X2-based machine, keep your eye on price announcements. Despite the various uncertainties, if you currently have a single-core processor in your PC, buying or building any system featuring a dual-core CPU is going to provide you with heaps more processing power to run plug-ins and soft synths. Just be careful that your prospective purchase is compatible with any special hardware that you have, such as DSP cards and expensive audio interfaces, either by checking with its manufacturer or posting on the SOS Forums to find others who have tested the waters for you.